At RK Venture, we have a philosophy to our business. This philosophy compels us to seek work that serves a purpose that benefits not only our clients and their goals, but the communities that they serve as well. When we heard the story of Villa Myriam, a local coffee producer and retailer, we became attracted to their business philosophy which seemed aligned with our own. They serve their communities through sustainable farming (using single source beans), paying their employees a living wage, and giving back to the community that has supported and embraced them. And, honestly, coffee is just cool. Graphically, the design possibilities are exciting. Telling their story and branding their company is a great fit for us. 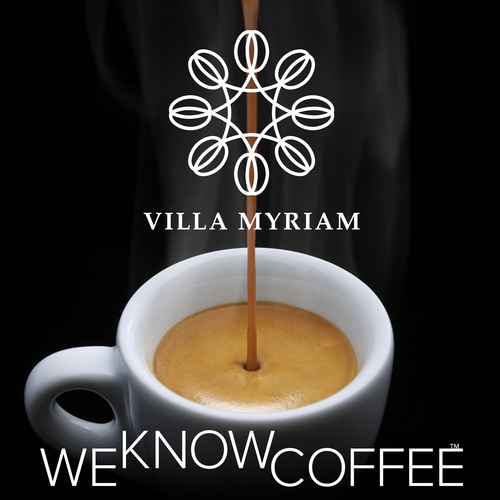 Villa Myriam’s business’ beginnings can be traced back to the owners’ grandfather’s farm in Colombia. Brothers Juan and David Certain came to the United States as political refugees in 1999. As much as they loved New Mexico, its landscape and people, the coffee they found here wasn’t so great. And these guys know coffee; they’re experts. Having grown up near their grandfather’s farm and business, it seemed the perfect venture for the brothers to explore. They started by importing the coffee beans from the family farm and roasting them in a small commercial kitchen at the South Valley Economic Development Center. The product was a success. They were able to sell their beans wholesale to some of the area’s most renowned businesses such as Los Poblanos, Hotel Parq Central and The Range Cafe. The Brew, their neighborhood downtown coffee shop, came next. They are also selling new products, Nitro Cold Brew Coffee and Tea, unique products sold in cans. With the different businesses, products, and endeavors, we had the opportunity to design a cohesive brand that can meld their various endeavors. The logo has been updated, keeping their type and adding a “bean crown”, the graphic designed by RK Venture’s Senior Designer, Rudi Backart. There are also other creative ways to tell their story graphically and literally that are being explored. So stand by. The opportunity to design for a cool, emerging business is not the only reason we’re so excited about this new client. They have the kind of business we love, one that’s a family tradition blended with new products and ideas. An uprooted family going back to their roots to create a new take on an old business in a new land. What’s not to love? Coincidentally, RK Venture has two Colombians working in its office: Dianne De Leon and Mario Moreno. Dianne was born in Queens, New York to Colombian parents. Mario was born in Bogota and moved to Long Island at the age of 5.